Even living in a slightly warmer climate, there’s just something about winter that makes me crave hearty, warm, soups and chilis. These warm and hearty dinners are even better when they basically prepare themselves. That’s one of the things I loved about this chili. I literally threw all of the ingredients in my slowcooker and let time do the rest. 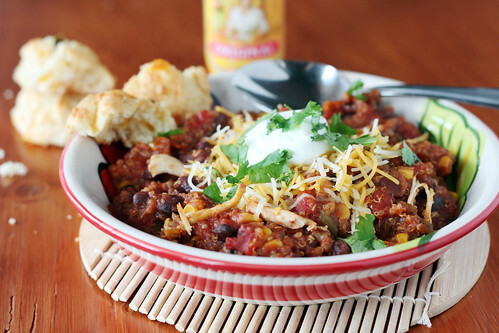 The other great thing about this chili is that its good for you! Loaded with good for you quinoa, black beans, tomatoes, and corn and have very minimal fat (especially if you top it with nonfat Greek yogurt and low fat cheese!). Oh, and they go perfectly with those Cheddar Jalapeno Drop Biscuits I posted last week! I was excited when I found this recipe, but of course I had to make a few adjustments. First, I like a bit of smokey spicy taste to my chili, so I replaced the bell pepper with chipotle pepper. Second, I upped the smokey flavor by using fire-roasted tomatoes. If you can’t find fire-roasted tomatoes (or don’t care for them) you can of course use regular tomatoes, but I really loved the flavor they added. I also cut back just a bit on the chicken stock and added some tomato paste. I wanted a thick chili and I think the result was really great. Finally, I had a huge split chicken breast thawed, so I used that instead of boneless skinless. I’m sure the bones helped to add a little bit of flavor, but to be honest the breast was so tender it just fell away from the bones, and it was kind of a pain making sure that I got all of them out of the thick chili. Next time I’ll probably go the boneless skinless route (and the recipe below will reflect that). Throw all of the ingredients in a Crockpot/slow cooker (6 qt size). Cook on low for 5-7 hours. Remove chicken and shred with forks, then return to chili. Reduce heat to warm until ready serve. Serve with sour cream (or greek yogurt! ), cheese, cilantro, hot sauce, and/or biscuits. This looks awesome! Definitely a great idea to use the chipotle in there, and I bet chicken thighs would be a good choice. Yum. Slow cooked quinoa… in chili! Deliciously intriguing. This looks amazing!! And I love it even more that it’s cooked in a crockpot! Those are my type of meals! Yum! This looks great and healthy! 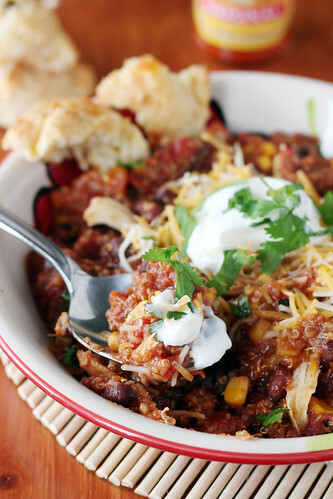 I’m always looking for new ways to make chili-I love this! Can’t wait to try it! I recently “discovered” quinoa so I’ve been gathering recipes using it. It was so nice to come home to a complete meal with my new favorite grain. I liked the spice of chipotle and red pepper. Thanks for the recipe! I made this today and I am so impressed with how good this Chili is. It has so much flavor and the quinoa works amazingly well. I followed the recipe with just a few minor tweaks to use what I had on hand. I only had one can of black beans and one can of kidney beans so I used them instead. I used a half of fresh onion chopped instead of minced onion and I doubled the chili powder. I also waited until almost the end to add the chipotle peppers to control the heat. Last time I made chili and added them at the beginning it was too hot for me to eat lol. Fabulous dish, thanks for the recipe! !